Birdhouses should be placed in fall or winter, if possible. Swallows may use nest boxes set out during late May or early June, but owls, chickadees, and woodpeckers begin looking for nest sites during February, March and April. Always face the birdhouse so the entrance is protected from prevailing winds. Kestrel nest boxes should be placed at the edge of a forest area or on a post in an open area 12-20 feet above the ground. Boreal Owls prefer mixed spruce-hardwood forests, while Saw-whet Owls prefer to nest near the edge of spruce or deciduous forest groves. Woodpecker nest boxes should be placed 6-20 feet above the ground, though Hairy Woodpeckers prefer nest sites 12 feet or more above the ground. Common Flickers nest in open areas and open park-like areas, while Hairy and Downy Woodpeckers prefer open deciduous forests. Chickadee nest boxes should be placed on trees in wooded areas. 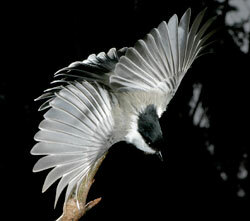 Boreal and Chestnut-backed Chickadees prefer coniferous forests, while Black-capped Chickadees prefer deciduous woods. Chickadees nest 6-15 feet above the ground. Sawdust or woodchips may be placed in the bottom of chickadee nest boxes. Chickadees prefer split-log nest boxes. Nuthatch nest boxes should be placed 6-20 feet above the ground on a tree in mixed coniferous-hardwood forest. Nuthatches perfer split-log nest boxes. Bluebird nest boxes should be placed in open areas like field edges on poles or fence posts 5-10 feet above the ground. This bird is found in only a limited area of east central Alaska and cannot be attracted in other areas. 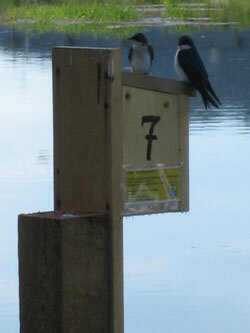 Swallow nest boxes should be placed in open areas including cities, field edges, open forests, lawns or gardens. Place the boxes 10-20 feet above the ground on posts, trees or beneath house eaves. Snow Bunting nest boxes can be placed almost anywhere in tundra habitats. Snow Buntings will nest in boxes on the ground, on posts, or on a house in alpine, wet or moist tundra areas. However, nest boxes on the ground may allow easy access to predators. Don't let your birdhouses become homes for Starlings or House Sparrows! These birds were introduced into the contiguous United States from Europe during the mid-1800s and early 1900s. Both species spread throughout North America and have become serious agricultural and urban pests. In addition, both species compete with native North American birds for cavity-nest sites and thus may harm native bird populations. For example, nest site competition by Starlings and House Sparrows has been blamed, in part, for the population declines of the Eastern Bluebird, a cavity-nesting bird. 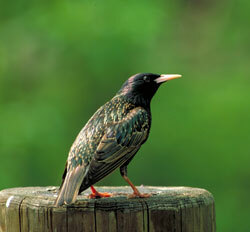 Although both species have been found in Alaska, only Starlings have become established, as yet. Starling nests have been recorded in central and southeastern Alaska, and the species is regularly observed in southcoastal and western Alaska. Starlings and House Sparrows will use nest boxes with entrance holes larger than 1½ inches in diameter. Keep a careful watch on your waterfowl, owl, woodpecker, and bluebird nest boxes to be sure that Starlings and House Sparrows do not invade them. (Please report any observation of Starlings or House Sparrows to Alaska Wildlife Observations, c/o University of Alaska Museum, 907 Yukon Drive, Fairbanks, AK 99701). American Robins, Say's Phoebes, and Barn and Cliff Swallows will not use nest boxes, but they will next on platforms that are open on three sides. Platform nest ledges should be 6-7 inches wide, 6-7 inches long, and at least 8 inches high. Nest ledges can be easily fastened under the eaves of houses, buildings, bridges or on trees. They may be placed near a window where the behavior of birds using them can be easily observed. Place the nest ledge 8–16 feet above the ground. Chickadees, owls, and woodpeckers that remain in Alaska during winter use natural tree cavities and birdhouses as roosting sites. These roosting sites provide protection from wind and snow and extra insulation against the cold. Any birdhouse can provide a winter roost site if it is properly built, but better insulated birdhouses can also be constructed. Try placing perches on the inside of a birdhouse. During severe cold several chickadees sometimes share their body heat by roosting together in a single cavity.